Brett Westwood admires how the impossible-looking creature once known as the cameleopard journeyed from the plains of Africa to a place in people's hearts the world over. Brett Westwood admires how the impossible-looking creature once known as the 'camelopard' went from a beloved creature in the African plains to becoming a worldwide sensation spreading 'giraffemania' as news and sightings of its striking beauty travelled around the world. Author Michael Allin tells the story of 'Zarafa' a giraffe taken from Ethiopia to the docks of Marseille that then walked into the heart of Paris, art historian Dr Alexandra Loske describes how King George IV's ailing giraffe was a metaphor for his rule of Britain. We hear from a man whose project sent giraffes viral way before the internet had been taken over by cat and dog memes and we take a more serious look at how giraffe numbers are falling but the world seems not to be listening. Michael Allin was born in 1944. He is a screenwriter, known for Enter the Dragon, Flash Gordon and I'll Be Home for Christmas and author of Zarafa: A Giraffe's True Story, from Deep in Africa to the Heart of Paris. It chronicles the story of this remarkable animal, revealing a kaleidoscope of history, science, and culture that opens an exotic window on the early nineteenth century. 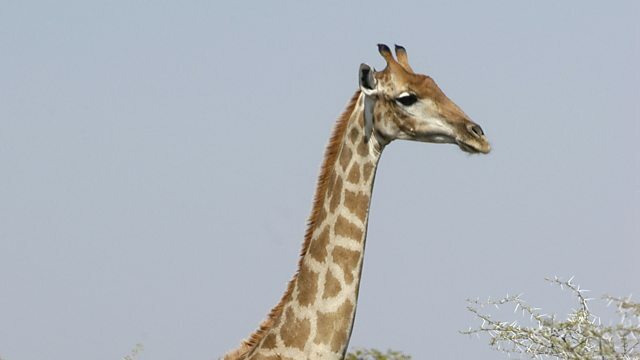 On the 6th of June 2009, Ola Helland made a bet with his good friend that he could use the internet to ccrowd-source images of one million giraffes. 102 countries helped out as he tried to reach his goal in what was one of the earliest viral sensations in the emerging world of social media and you can see them at the One Million Giraffes website. When not collecting giraffes Ola is senior user experience designer from Stavanger, Norway. Dr Alexandra Loske is an art historian, curator and editor with a particular interest in late eighteenth and early nineteenth century European art and architecture. She was born and grew up in Germany, came to England in 1997 and has been working at the University of Sussex since 1999. She investigated the story of the first ever known giraffe in Britain, given to George IV as a diplomatic gift in the early 19th century. “I discovered the giraffe when we acquired Lord Baker’s collection of regency caricatures, political cartoons from mostly the early 1800s. I spotted prints where a giraffe featured and I thought, ‘that’s curious – why is there a giraffe?" she said. She is also managing editor of the Frogmore Press, which was founded in 1983 and publishes the literary journal The Frogmore Papers and other collections. Arthur is Giraffe Conservation Foundation’s East Africa Coordinator, a new role set up to bring together research efforts and partnerships to secure the future of the three subspecies that occur in the region: Masai, reticulated, and Rothschild’s giraffe. At the same time, Arthur is pursuing his PhD at the Research on the Ecology of Carnivores and their Prey laboratory at Michigan State University. Originally from Rwanda, he spent his formative years living and learning in Kenya, one of the most biologically diverse countries in Africa, where he nurtured an interest in wildlife ecology and conservation. You can watch Arthur and the team translocating giraffes in this video that features in the programme. It was produced by Michigan State University Agriculture and Natural Resources Communications. Angela Stoeger is an expert in mammal vocal communication at the University of Vienna, particularly the versatility of acoustic signals, evolved perceptual mechanisms and underlying cognitive abilities. Her main model species are African and Asian elephants, highly social mammals that combine a capacity for vocal learning with complex cognitive skills and she is supervising students conducting observational and experimental research on captive and free ranging animals such as giant pandas and giraffes. Will Walker is animal manager at the Wild Place Project owned and run by Bristol Zoo. He led the construction of a state-of-the-art giraffe enclosure and three giraffes Dayo, Gerry and Tom, arrived at the attraction earlier this year.